Many of the questions tackled by the two Ambassadors related to the recent announcement that the EU and USA would begin negotiations for a new Transatlantic Trade and Investment Partnership. Other issues ranged from foreign policy to favourite restaurants in Brussels. 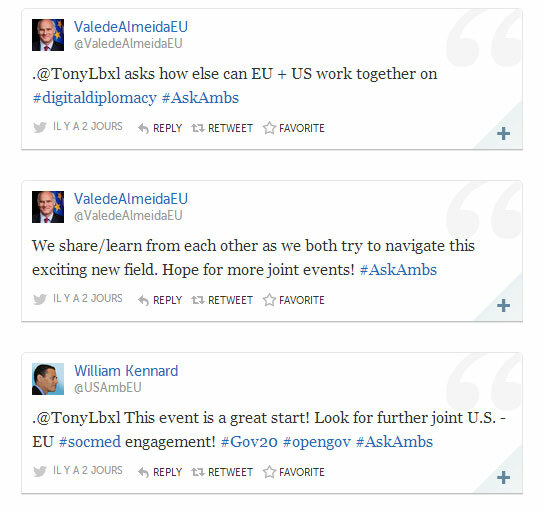 I was pleased to receive a positive response from both Ambassadors to my question about future EU-US cooperation on digital diplomacy. For further information, see the great Storify of this first Transatlantic Twittersation produced by the US Mission to the EU.